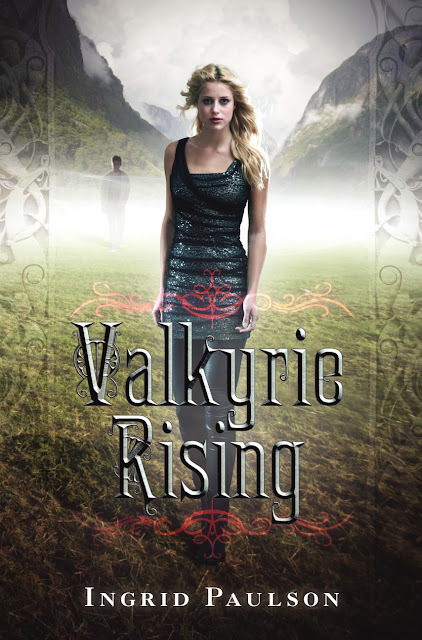 Valkyrie Rising is the young adult debut novel of Ingrid Paulson. It is a mythology-based story set in modern Norway about Elsa "Ellie" Overholt, who discovers a family secret and more to this world during a visit to her grandmother's in Norway. The Writing of Valkyrie Rising is something that I belive would be perfect for teen readers and other lovers of YA. The characters are interesting and engaging, and the plot never really dragged. The writing style itself is something that teens will have no trouble flying through, and the first person point of view will give the reader a chance to get to know Ellie and connect with her. Ellie is a fairly normal teen girl whose only real gripe is her very overprotective older brother, Graham. She has a bit of a like-hate relationship with Tucker (Graham's best friend), which is explored in the course of the novel. The minor characters were also well-done, and I especially loved Loki and Astrid. Loki was portrayed to be fairly true to the myths that I've read, and Astrid was awesomely kickass. My only gripe about the characters was that everyone was so damned beautiful. Ellie herself came awful close to being called "Mary Sue" a few times, but I'll back away from that and say that she's not. Valkyrie Rising is available to purchase today at your local bookstore or online. Be sure to also add it to your "Want to Read" pile on Goodreads! To satisfy FTC guidelines, I am disclosing that I received the book for reviewing purposes as a part of a Southern Book Bloggers tour in exchange for an honest review. The advance copy was provided to the tour by the publisher, which has in no way affected the outcome of my review. All opinions expressed are rambling, honest, and completely my own. Awwww, I'm glad you liked this one. I lurved it, mostly for the dynamics between Tuck and Ellie, but I loved that the mythology was actually in an appropriate setting too. The Greek or Norse gods running around the US just confuses me.